The morning of May 4, there were a few subtle signs that something was up. A few photos from the Concord Academy archives had been hung around the school. Then at 10:25 a.m., Dean of Students Sally Zimmerli sent an email — its words emphasized in red and blue — declaring an all-school meeting. By the time everyone gathered in the Elizabeth B. Hall Chapel just before noon, excitement about the unexpected assembly was palpable. 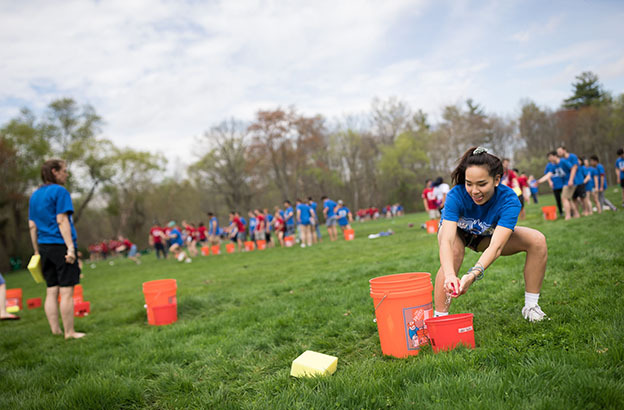 When the student head and vice head of school, Kaity Goodwin ’18 and Theo Nunez ’18, revealed their red and blue shirts and declared that the rest of the day would be a field day, students erupted into cheers, clapping and stomping their feet. After heading outside to get their team assignments and grab shirts of their own, for the next three hours they threw themselves into friendly competitions, and a new tradition was born. The idea for a field day has surfaced at the junior leadership retreat year after year, but no one had managed to pull it off. Around 15 rising seniors nevertheless latched on to the concept last spring, brainstorming various ideas for configuring teams and the most inclusive games to play. And Kaity, inspired by the field day she took part in at her middle school, was already committed. She made a field day part of her platform when she ran for student head of school and established it as an initiative early this fall. When an opportunity presented itself this spring, Kaity delved into the history of Red and Blue Day at CA, a field day that once divided the student body into two teams — once a beloved tradition, Red and Blue Day died out in the 1970s around the time the school went coed. With help from Zimmerli and librarian Martha Kennedy, Kaity looked through archival photos, yearbooks, scrapbooks, and books on CA’s history. She spoke with a few faculty members whose parents had attended CA and were delighted to hear that Field Day would be revived. During the three weeks leading up to the event, she spent her time in one of her favorite pursuits, organizing. The afternoon began, under a light drizzle, with a 0.76-mile “marathon” around campus for anyone who wanted to run. Cowbells and cheers from both sides greeted runners who pushed themselves to finish-line sprints. As Kaity and Theo circulated among the students, walkie-talkies in hand, the red and blue teams painted banners. Faculty joined students and food services staff — everyone in a red or blue shirt — for a cookout in the Pocket outside of CA Labs. By the time the sky had cleared and the sun was shining warmly, still sipping lemonade, the community divided into several stations on the fields, where the games began. 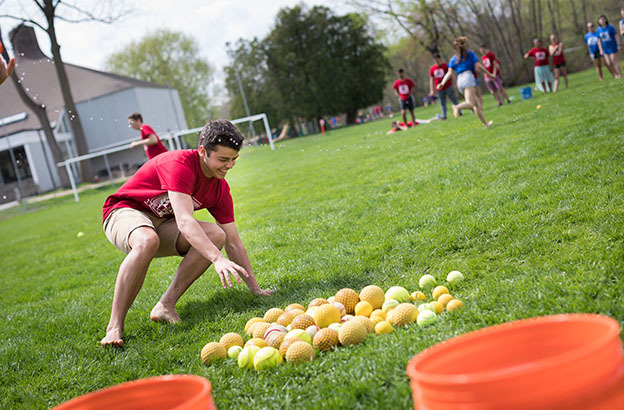 A three-legged race, an obstacle course relay involving puzzle-solving and dry-land canoe carrying, lawn games including spikeball and a beanbag toss — the activities offered something for everyone. “I spent a lot of time looking up various field-day games, thinking back to orientation activities, using my knowledge of what teenagers enjoy, and creating unique combinations of the three,” Kaity says. She admits that two of the games were inspired by classic Survivor and Big Brother challenges. In “Bucket Brigade,” student teams had to choose a strategy in a race to fill up buckets using big or little sponges. In “Pirate’s Gold,” students raced to retrieve neon yellow softballs before a blindfolded faculty “pirate” could squirt them with a super soaker. It proved a great way to cool off in the humid heat. Kaity says she was a bit nervous about how the surprise cancellation of classes would go over. “When I left the Chapel, I was shocked, but so happy, to be faced with a sea of blue and red,” she says. 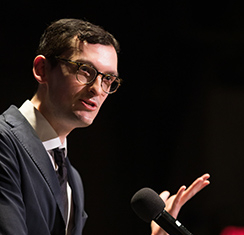 “I was pleasantly surprised by all the enthusiasm that people brought to representing their teams, and how willing people were to participate. The cheers that were happening were all organic and started by the students. 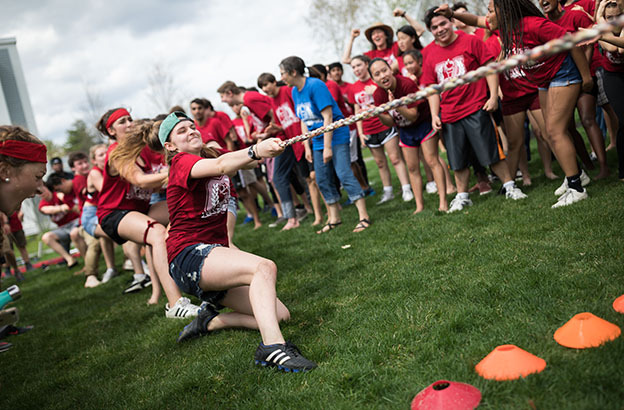 They were really into their team pride.” She credits the faculty and senior group captains for seamless transitions between activities and games. The afternoon ended with an intense tug of war between grades. The blue team’s freshmen and juniors won, as did the red team’s sophomores and seniors. 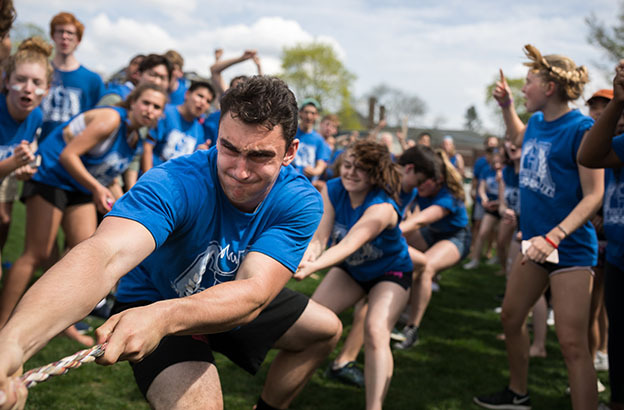 Both teams were tied for points, so the contest was ultimately settled by two students from each grade in a red-and-blue tug-of-war tiebreaker. The blue team won! Later that afternoon, everyone celebrated with treats from a Cookie Monstah food truck parked by the Stu-Fac patio. “I think that Field Day was the perfect event to uplift the spirit of the student body,” Kaity says. Randomly generating team assignments allowed everyone to mix and meet new people and gave everyone — including introverts and those who rarely join in — a chance to participate in a comfortable way and to support their fellow community members. Kaity hopes Field Day will become an annual event, with perhaps a few particular games becoming classics. She hopes too that the element of surprise will remain, and she’s curious about how the organizers who take it over will manage to keep it under wraps.